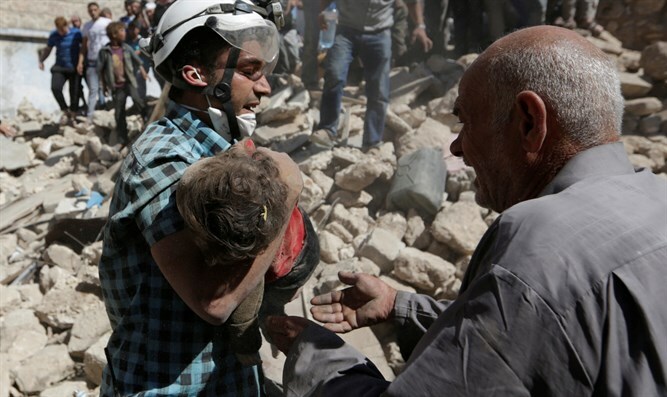 At least 58 dead, including 13 children, from airstrikes on Idlib, in which busy marketplace was hit. Truce only come into effect tomorrow. The death toll in airstrikes on the key northwestern Syrian city of Idlib jumped to 58 late Saturday, a monitoring group said. It was not immediately clear who carried out the raids, which hit a market and several neighbourhoods across the city. The Syrian Observatory for Human Rights said the dead included 13 women and 13 children, but it was not immediately clear how many civilians were among the remaining victims. The monitor said dozens more were wounded in the strikes, warning that the death toll could rise even further. It could not identify who carried out the strikes, but the Syrian government and its ally Russia have regularly conducted raids in Idlib province. "People were shopping before the (Muslim feast of) Eid al-Adha next week, which is why the toll is so high," said Observatory head Rami Abdel Rahman. The US and Russia brokered truce is to come into effect tomorrow (Monday). The deal demands that Bashar Assad's regime cease targeting certain specific areas with airstrikes such as this recent one in Idlib. For the long-suffering citizens of the war-torn country, the truce can't come fast enough.